Words, weapons, and WWI No.3: Gas! Gas! In the Words in War-Time archive, gas is yet another word for which linguistic productivity – and the potential for wide-ranging physical assault – would disturbingly unite in 1914-15. Written before war began, the relevant entry in the OED had documented modern uses in which gas was used to light domestic space and gas-engineers were ‘engaged in the making of gas, or in regulating its supply’ — ‘especially in theatres’, the Dictionary added. It tracked, too, industrial, as well as medical and scientific applications. The diction of war and conflict was, however, absent. The familiarity attested by Wilfred Owen’s ‘Gas! Gas!’ (in his ‘Dulce et Decorum Est’ of 1917), and the salience of gas as a weapon of attack, remained unknown. Only in 1933 was the entry changed and the Dictionary brought firmly up to date. 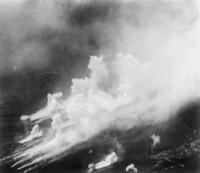 ‘First used in the war of 1914-18 by Germany on April 22, 1915’, the 1933 Supplement states with striking specificity; gas, it confirmed, now signified asphyxiating gas and poison gas. A range of collocations – gas shells, gas mask, gas bomb (among others) – all attest to the legacies of a changing langscape of war.